… to know which way the wind blows – Subterranean Homesick Blues, Bob Dylan, recorded on January 14, 1965. According to english.stackexchange.com, the lyric was the inspiration for the name of the American radical left group the Weathermen, a breakaway from the Students for a Democratic Society. In a 2007 study of legal opinions and briefs that found Bob Dylan was quoted by judges and lawyer more than any other songwriter, “you don’t need a weatherman…” was distinguished as the line most often cited. I mention this apropos of nothing other than I was at Traigh for their Open over the weekend and, as always, from the high points on the course, you don’t need a weatherman, you can see the weather coming for miles and there was plenty of it. While I am going off at tangents, I will make this not particularly original observation – to fully appreciate any music you must hear it in the context of its own time. This track and everything else on Bringing It All Back Home was a shining beacon of originality which inevitably fades with time and the production of more than 50 years worth of subsequent music. Nevertheless, I can still remember the excitement felt by that introverted 14 year-old as this album first emerged from the single speaker of the family Dansette. All the words are still inside my head. Northumberland has been clinging to the wreckage of autumn these last few weeks but its all over now. Despite Black Friday, despite the ever sooner onset of Christmas and the tyranny of things, it has been a quiet few weeks in Beaufront Woodhead. It is also a time of inner conflicts. The desire to play golf set against too damp courses and uninviting weather – the solution – head for the coast. The impatient need to be out on two wheels set against slippery surfaces, biting winds and too much salt on the roads – the solution – sit tight and polish the hardware. 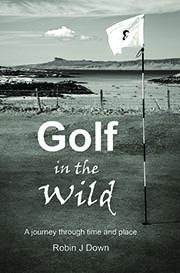 For now, the priority is the much delayed task of writing the follow-up to Golf in the Wild. My modest ambitions for the first version have been met – the production costs have been recovered and 800+ copies shipped. The sequel is progressing at a glacial pace – I am currently researching Loch Eriboll, just a few miles down the road from the return journey’s place of departure, Durness. Eriboll has some fascinating history, not least that in May 1945, this was the location for the surrender of thirty three U-boats, the pride of Germany’s Wolfpack. I could be stuck in these waters for weeks, but no matter, the days are short and the nights long. My internal roadmaps contain a section dedicated to the streets of Manchester in the 1960s. Most of these monochrome memories start from Oxford Road station with its three wooden conoid roofs, a remarkable building for its time with echoes of the Sydney Opera House. Even a self-absorbed teenager noticed such things but when it came to railways, I had previous. An avid trainspotter from the age of eight, what else was there to do, I knew Manchester’s stations intimately: Manchester Central, Piccadilly, Victoria and Exchange – all of them dark, filthy and rundown – hell’s Cathedrals. This was the norm, this was all I knew – smog, steam and rain – the assumption was that this was the way everything ended, Oxford Road included, the station where most of our journeys on clackety closed compartment trains from Altrincham would finish. Down Station Approach to the left was the Corner House Cinema specialising in ‘adult entertainment’ and to the right, along Oxford Road, was the Family Planning shop, nothing more than a hut beneath the railway bridge. I had no use for either of these services but like forbidden fruit, they intrigued. The main attractions were the musical instrument shops that lined the south side of Oxford Street, full of guitars and drum kits well beyond our means. At the junction with Portland Street was a sheet music shop, another frequent haunt – we were as likely to buy the sheet music as the vinyl. As I type this, the wind is blasting around the house, the rain lashing at the window and I fully expect the power to go off at any moment. 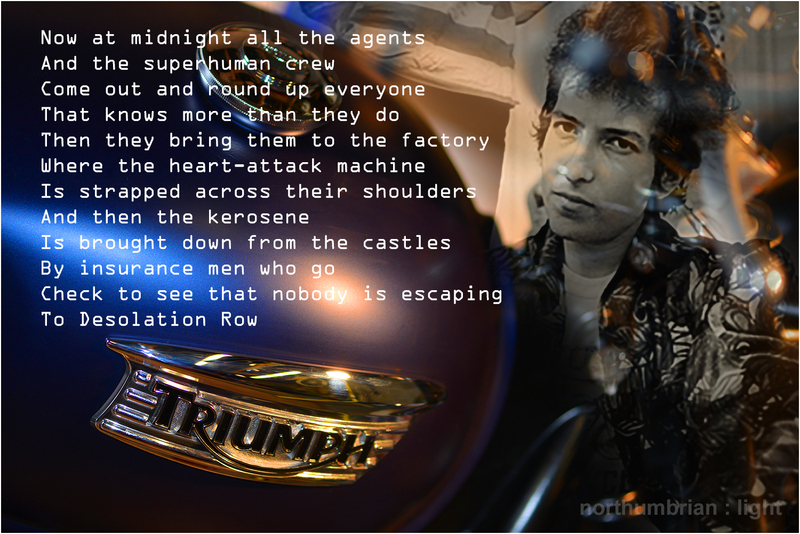 Highway 61 Revisited was released on 30th August 1965. It is now more than fifty years old and yet, it still sounds as fresh as when I first heard it, hidden away in my bedroom – turn that awful music down Robin – this minute! Except it wasn’t awful and I didn’t – so the rebellion began. Michael Gray, author of the first critical study of Dylan’s work, Song & Dance Man: The Art of Bob Dylan, argues that the sixties started with this album. By contrast, Joe Boyd suggests the sixties began in the summer of 1956, ended in October of 1973 and peaked just before dawn on 1st July 1967 (from his memoir, White Bicycles). … everything changes, just do what you think you should do – To Ramona, Bob Dylan. More than fifty years separate these images and much has changed in the intervening years, not least me. In the earlier photograph I have adopted a ‘workman-like’ pose in contrast to my usual preference for pulling faces at the camera. In the later image I prefer to hide behind the lens. 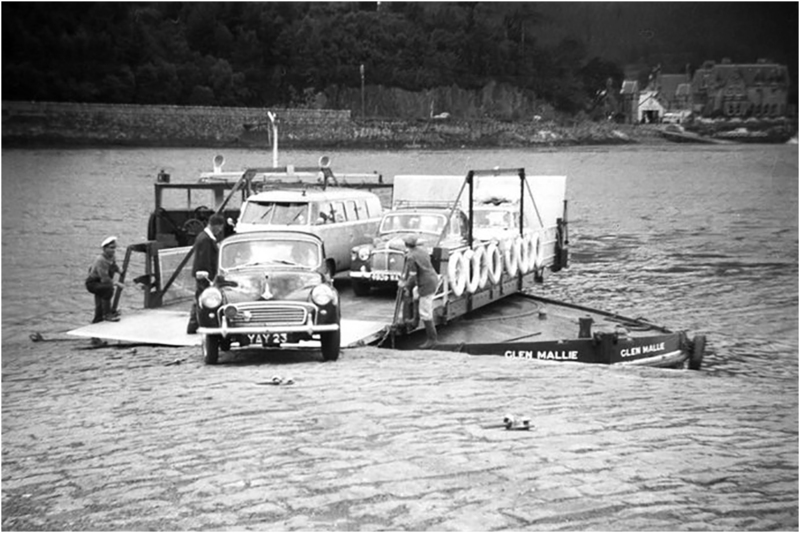 The cars from the 1950s are lined up for the Ballachulish Ferry which is now replaced by the bridge, visible in the second image. 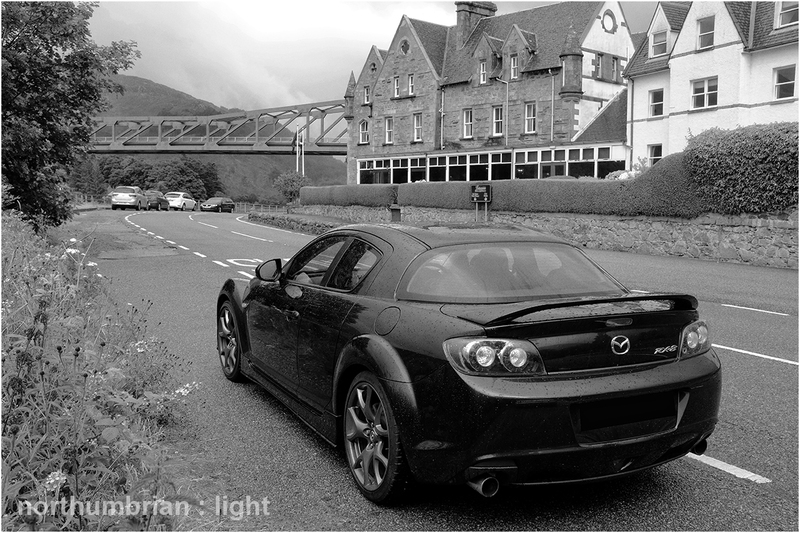 The hotel remains but the family car has transformed from plain and utilitarian into a sleek object of beauty. 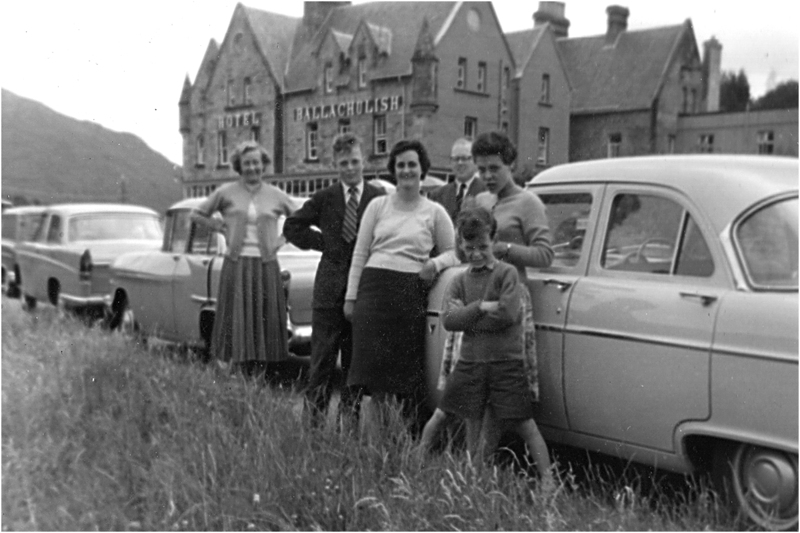 In the older image we are gathered around my Dad’s Ford Consul (331 ELG) while the car in front, an ugly-duckling Vauxhall Victor, belonged to my Uncle Ed – they should have kept the Jaguar. In 1959 we were travelling north to Cullen in Banffshire, a journey that took forever with an overnight stop in Callendar. We used the only section of motorway built in the UK at the time but it did little to reduce journey times – the 8.5 mile Preston Bypass which eventually transformed into part of the M6. In 2015 I have driven alone to play golf at Traigh near Arisaig, a brief few days away, not feasible in the 1950s. On my return I could not resist the delights of the Dragon’s Tooth Course squeezed between mountains and loch, a few hundred yards from the Ballachulish Hotel. It is a fine test of golf and feels like similar mature courses celebrating their centenaries but in 1959 it did not exist, the fields of Glenn a` Chadias were still being used for grazing cattle. Everything passes, everything changes. This final image from RMWeb.co.uk shows the ferry in action in 1962 from the other side of the loch, with the Ballachulish Hotel visible in the background. An early implementation of roll-on, roll-off.